Welcome to part four of this series of articles on the Pinan and Heian katas as a fighting system. In the first of this series of articles, we looked at the background of the Pinan / Heian katas and discussed how they are said to represent a complete fighting system that contains techniques for use at all stages and all ranges of a fight. We also discussed that whilst the modern order in which the forms are taught is based upon the relative technical difficulty of the solo performance of the forms, the original order is based upon the progression of a live fight. 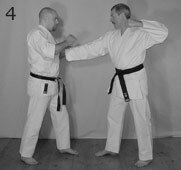 We saw in part one how Pinan Shodan (Heian Nidan in Shotokan) predominately deals with the initial exchange of limbs, in part two we saw how Pinan Nidan (Pinan Shodan) moves on to mainly deal with techniques that can be applied once the initial grip has been established, and in part three we looked at how Pinan / Heian Sandan deals with techniques that can be used when fighting from a clinch. As you may remember from part one of this series, in addition to the main progression in content - which is based on the progression of a live fight - the Pinan Series also includes a sub-progression based on the relative technical difficulty of the applications. Once a karateka is familiar with the applications of the first three forms, they will have acquired the fundamental skills for fighting on their feet, regardless of distance (we'll briefly look at where ground work fits in to the Pinan series in part five). What Yodan and Godan then do is further develop the skills acquired through the study of the first three forms. In this article, we will look at some of the applications of Pinan / Heian Yodan and, in particular, show how the form develops the skills needed to continuously control an opponent's motion at close-range. The best place to start is probably the first few moves of the form. When we look at this application, you will notice how the opponent is continuously controlled and how the technique requires a marginally greater skill level then the techniques recorded in the first three katas in the Pinan / Heian series. The first two moves of the form are identical apart from the fact that they are performed on opposite sides. The first movement shows what should be done if the opponent's right hand was trapped. The second movement shows what position should be assumed if the opponent's left hand was trapped. The third and forth movements obviously follow on from the second movement and would need to be reversed if it was the right hand that was trapped. We shall show the application of this sequence assuming it is the left hand that has been trapped, as this is probably the easiest to follow. During the fight, the opponent's left wrist has been seized. Move to the outside, so that you are sideways to the opponent. Remember that a sideway motion in a kata means that you should be sideways relative to the opponent when applying that technique. Place the edge of your free hand just above the opponent's elbow joint. This is the application of the initial 'open-handed block' (Fig 1). Pull on the opponent's wrist as you push just above their elbow joint. Simultaneously shift your weight in the direction of the pull (as per the kata) in order to enhance the execution of the technique. This will cause the opponent to instinctively move away from the lock and will position their head directly in front of you (Fig 2). Seize the opponent's shoulder in order to prevent them from moving or regaining an upright position. Your bodyweight is then shifted forwards as a punch is delivered to the base of the opponent's skull. The grab and strike being the application of the 'lower cross-block' (Fig 3). On the application we have just discussed, you will notice how we shift our weight in order to enhance the effect of both the lock and the punch. You will also notice how the arm-lock is used to control the opponent's motion and to position them for the following strike. Control over the opponent is never lost and this is one of the key principles developed by this form. The next example we shall look at is a technique that can be used when the opponent has seized your clothing. This combination requires a greater skill level than the more direct methods for dealing with grips that are found in Pinan Nidan (Heian Shodan). Therefore, this particular method is not introduced until first the three katas are understood and the student has grasped the more fundamental methods. Once again, you will also notice how the opponent is continuously controlled. This technique is the application of the sequence where the hands are stacked above one another prior to the delivery of a simultaneous kick and an extension of the arm. The sequence is performed at ninety-degrees which, as we have already discussed, means that you should be at ninety-degrees to your opponent when applying the technique. The opponent has managed to secure a grip on your clothing (Fig 4). At this point the opponent's back hand is posing the greatest danger. Seize the opponent's hand and turn to the side. This will move you out of the line of any punch and will lock the opponent's arm (Fig 5). Notice how the turn to the side is a fundamental part of the movement that lessens the chances of you being hit whilst disadvantaging the opponent. The kata then tells us to pull the opponent back by their hair whilst a simultaneous kick is delivered to the knee (Fig 6). 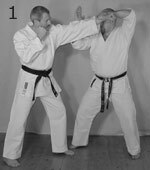 In the Wado-Ryu and Shito-Ryu versions of the form, a front kick is executed and the hair pull is labelled as a 'lower-block'. In the Shotokan version of the form, a side kick is executed and the hair pull is labelled as a 'back-fist strike'. Both versions work well and are effectively interchangeable. Following the kick and pull, the opponent's head is then controlled and an elbow strike is delivered to the opponent's jaw (Fig 7). We can see how Yodan helps to develop the skills needed to continuously control an opponent as you move from technique to technique. Pinan Yodan contains a great many combination techniques that continuously control the opponent and I'd refer you to the first volume of my Bunkai-Jutsu video series if you'd like to learn some more. However, it is hoped that the two examples shown in this article will help to illustrate the progression beyond the more fundamental methods introduced in the first three Pinan / Heian katas. In the final part of this series of articles, we will look at some of the combinations found in Pinan / Heian Godan. As you will see, Godan contains the most advanced techniques in the Pinan / Heian series.